Mayo Intercultural Action (MIA) and the Palestine Children’s Charity in Galway would like to thank all those who contributed to the successful collection of items of aid for Gaza last Friday. 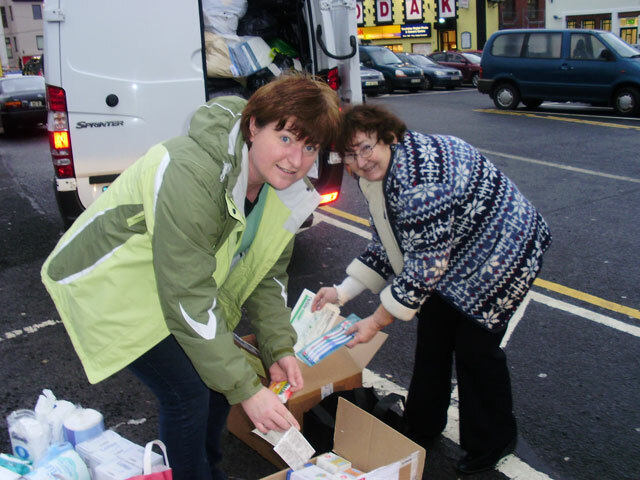 The generous people of Castlebar and surrounding areas contributed three large van loads of goods such as non-perishable food, clothes, shoes, household textiles, medical supplies, toiletries, toys, books and writing aids. Large donations of medical supplies and aids were also received from some local pharmacies and the local hospital. Many people also came along with financial donations which will help to allay the costs of transporting the goods and buy more supplies. Back row, L to R: Jim Hogan, Thérèse Crowe (MIA volunteer), Thérèse Ruane (MIA), Fionnuala McKenna, Elaine Sheridan (MIA). Front row, L to R: Nolene Crowe (MIA volunteer), Calum McKenna, Liam Costello. 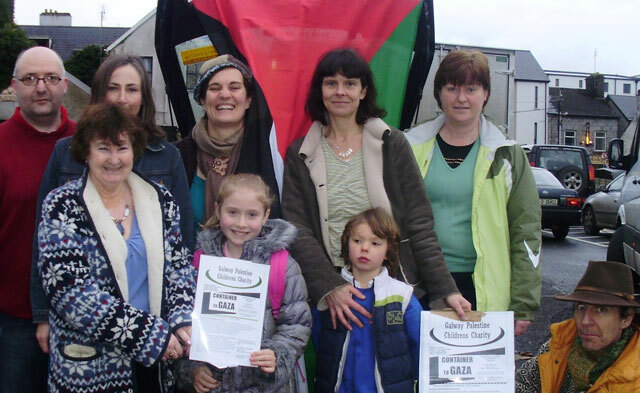 The container left Galway, on Saturday last, bound for Gaza via Cork and Egypt. A lot of hard work by volunteers made this collection a great success, including those who advertised the collection; those who helped pack the donated items and those who volunteered their time and their vans to transport the goods to Galway. Many individuals also took it on themselves to organize collections in their workplace or local area and their help was greatly appreciated.